Recent observations from the ALMA radio telescope array have found some galaxies are extremely efficient at producing new stars, with some galaxies creating stars at an average rate of 800 per year. Most galaxies produce stars at a rate proportional to their size. The more stars a galaxy has, the more stars it tends to produce. It’s a relation known as the galactic main sequence. Given the size of a typical galaxy, they tend to produce stars at a rate of about 100 – 200 per year. The reason for this relationship seems to be that the more stars a galaxy has, the more gas and dust is produced as those stars die, which is available for new stars to form. Some galaxies are mostly older red dwarfs, which don’t explode when they die, and these galaxies tend to have a low star production. Other galaxies, known as starburst galaxies, produce stars at a much higher rate. 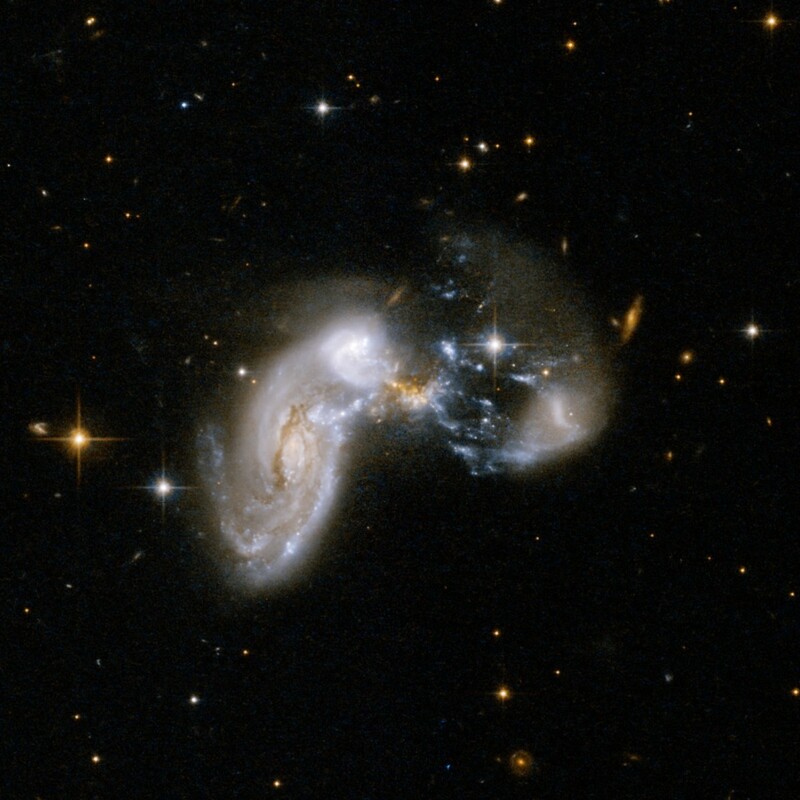 These are typically the result of galactic collisions, such as the galaxy Zw II 96 shown above. Some starburst galaxies produce stars at such a high rate that it raised an interesting question. Do galactic collisions cause tremendous amounts of dust to be formed, or are starburst galaxies producing stars more efficiently than other galaxies? It’s been a difficult question to answer, because cold gas and dust in a galaxy is difficult to observe. It doesn’t emit light in the visible spectrum, and the light it does emit isn’t particularly bright. But the Atacama Large Millimeter/submillimeter Array (ALMA) was designed to observe the faint microwave light from cold gas and dust. Recent observations from ALMA have allowed us to measure the amount of this dust in starburst galaxies. 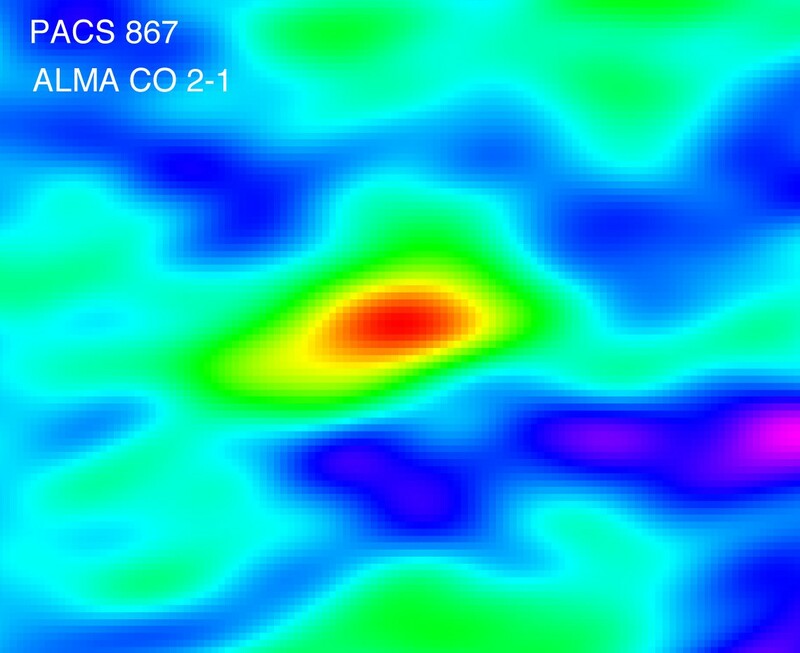 In a recent article in the Astrophysical Journal, a team looked at the distribution of carbon monoxide (CO) in seven starburst galaxies. Carbon monoxide is one of many molecular components of interstellar gas in a galaxy, but it has the advantage of having a bright emission line making it easier to observe. The level of CO in a region is a good indicator of how much gas and dust there is in the region. The team compared CO levels with the rate of star production as measured from Spitzer and Herschel Observatories and found that even after CO levels were depleted star production remained high. This means the rate of star production in starburst galaxies isn’t simply due to the amount of gas and dust available, but that starburst galaxies are actually more efficient at producing stars. Just why this is remains unclear. 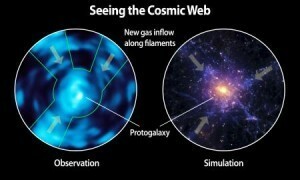 It may be that the formation of stars triggers additional star formation in a kind of feedback loop. What’s clear, however, is that star production can be far more efficient than we thought. 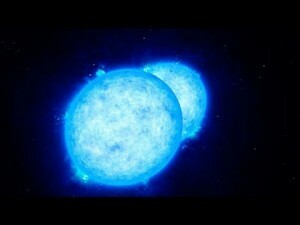 This could have played an important role in early galaxies where galactic collisions were more common. When galaxies collide, aren’t there shock waves travelling away from the impact zone? Sort of like sound waves. It ought to create compressions and rarefactions. You’d expect increased star production in the compressions. Just wondered if that explained elevated star production despite depleted CO.
Science is great! There are things far, far worse than ALMA.